As MMO Fallout’s official only staffer and the internet’s number one games journalist, I’ve seen a lot. Betas, alphas, pre-alphas, day one patches, you name it. Last year I reviewed to rather poor reception the pre-release build of Shadow of War, and while the preview was condemned as “tone deaf” and “stupid,” I came out of that experience pretty sure that I would never encounter an odder product. And then this week I was sent what I can only assume is a beta build of Old School RuneScape Mobile. Now I’ve been in some strange betas before, including one for [redacted] where the developer asked us to download a Torrent and then had the nerve to ask us to seed it for each other, but this takes the cake. My beta instructions came in a fancy little box which, upon opening, revealed its contents to be mostly powders and some strange doohickeys: stars and little bits of paper that say “RuneScape Old School” on them. 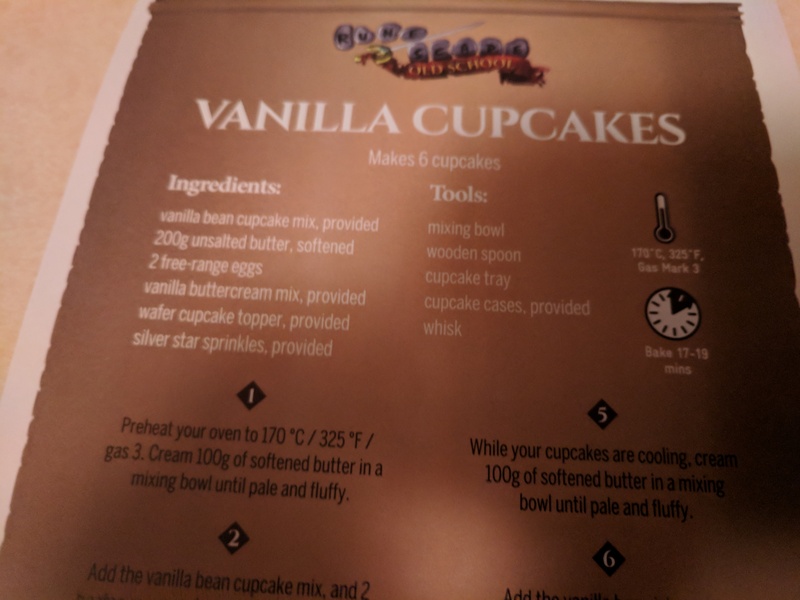 The beta version I was sent is code named “Vanilla Cupcakes,” suggesting that someone at Jagex is taking cues from the Android style of naming updates. A little bit odd, but I had a job to do. Now I don’t know much about technology, being a tech journalist, but I do know that one of the basic tenets of mobile is that apps are supposed to be simple to start. Take the photo app I’m using to capture these pictures, I click once to start the app, then click once for every photo I want to take. The setup for this beta has eight steps, the first of which includes preheating the oven and creaming some butter. Clearly this must be some kind of trial, after all RuneScape is about overcoming bigger foes and if I can’t 1v1 some butter, then what kind of scrub would I be to take on the full beta? This is like one of those Man Crates, that novelty item where the contents are delivered in an actual crate that you have to open with a crowbar. 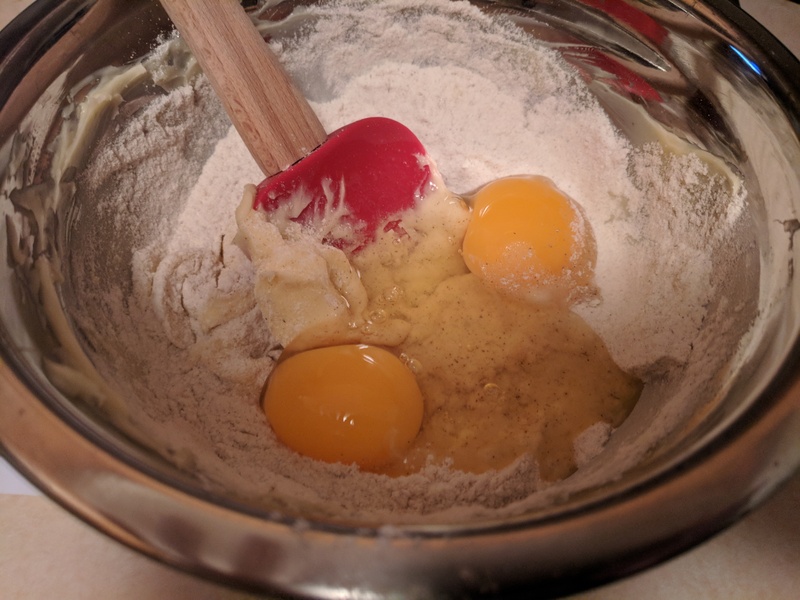 The first half of the tutorial asks you to solo pk some butter, followed by cupcake mix and two eggs at the same time. I’ve been playing RuneScape long enough to remember the Recipe for Disaster quest so none of this really blew my mind. I had to provide my own eggs though, I hope this is going to be fixed for the full release. All this butter drops on death is more butter. The OldSchool RuneScape beta comes in the form of six consumables, not unlike how Nintendo handles demos on its systems, and they appear to expire after a couple of days once loaded and you pretty much have to prepare them all at the same time, so I’ll have to make good use of each one. I went onto the RuneScape Reddit to see if anyone else was complaining about this style of beta build but couldn’t find a single person talking about it. I guess this business model is just accepted now. And then I saw this note and everything became clear. Silly me, this isn’t the beta itself, it’s a quest that will inevitably lead me to the beta. Just to show there was no hard feelings, I took the six “mobile devices” I was sent and decided to toss them in the oven to think about what they’d done. A good seventeen to nineteen minutes at 325 degrees will teach a valuable lesson about coming into my kitchen and bamboozling me to get my eggs. Boy does it smell like vanilla bean in my house. While I let those hotheads cool off, a statement which I’m pretty sure doesn’t qualify as a pun, I went back to the task list. 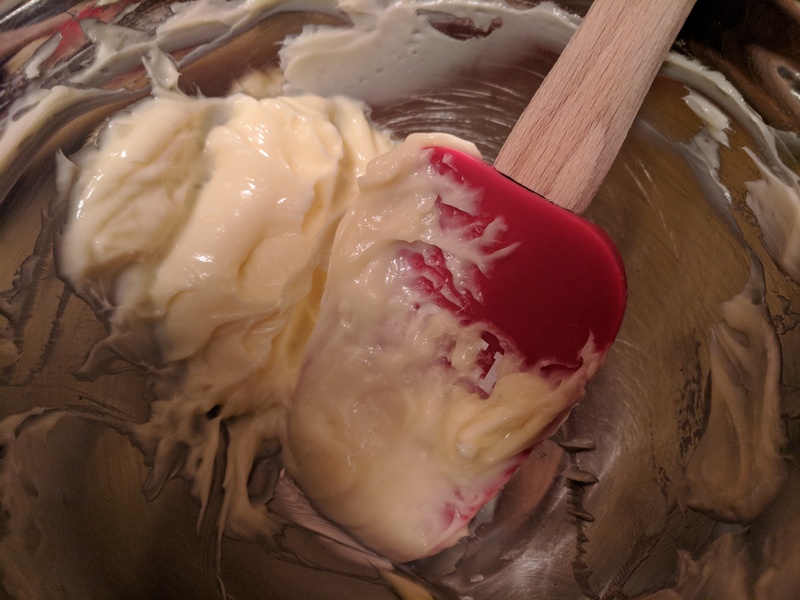 Next step was to cream more butter and beat it with the icing mix. You know it’s hard to fully comprehend just how much butter is in 200g of butter until you see it sitting out on a measuring plate. Hint: It’s a lot of butter. As I creamed the second batch of butter, I got to thinking about the possibility that I’ve been doing this whole thing wrong and that the list of instructions may have just been a metaphor not meant to be taken literally, like I’d come to find that it’s not the cupcakes on the plate that matter but the cupcakes in my heart. 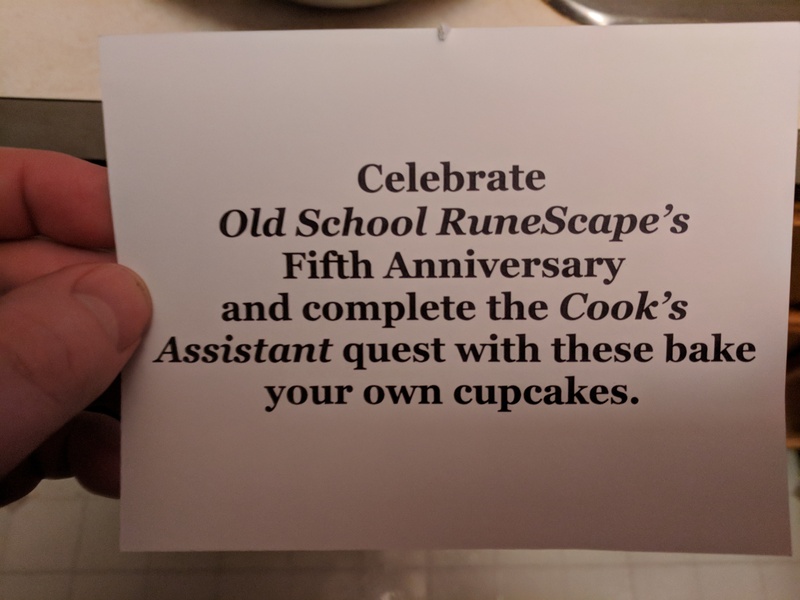 Perhaps this was a sort of strange live event and, upon my completion, my door would be kicked in by Mod Ash who would grab the cupcakes and make a run for it. 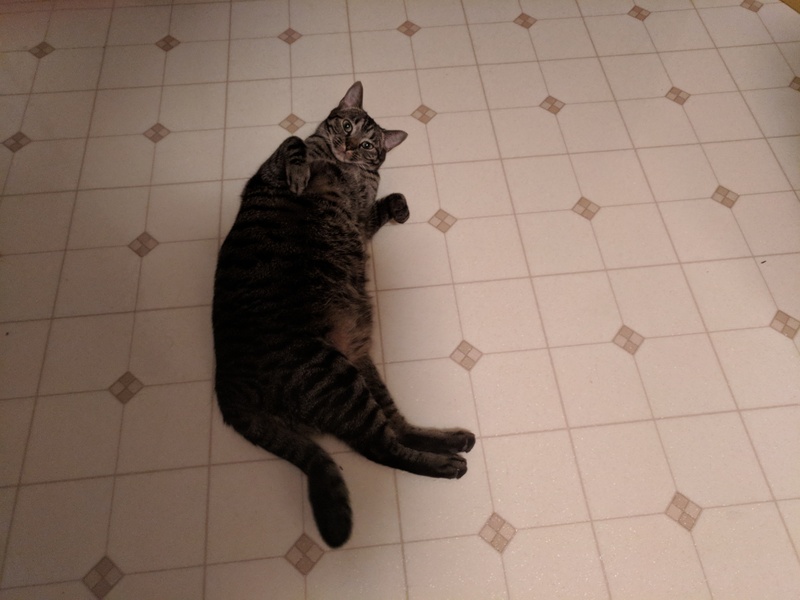 Maybe, just maybe, I was the target of the world’s most genius, not to mention expensive, plot to trick someone into baking snacks for some hungry, tired developers. Ocean’s Eleven, but British and with only six people. 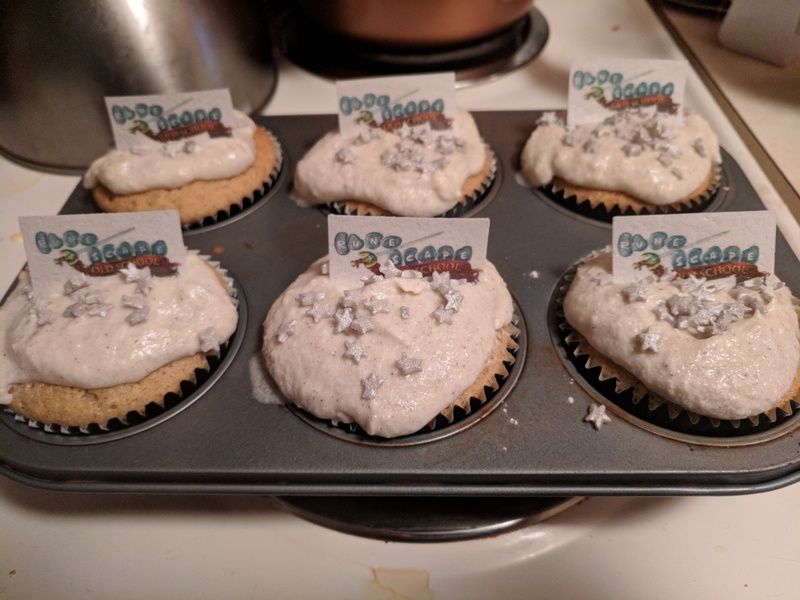 The last two steps are to cover the cupcakes with icing and then decorate with the stars and those bits of paper with the RuneScape logo on them. The instructions call them “wafers” which apparently mean edible paper, as if implying that the stuff you use to print documents isn’t edible, but I digress. 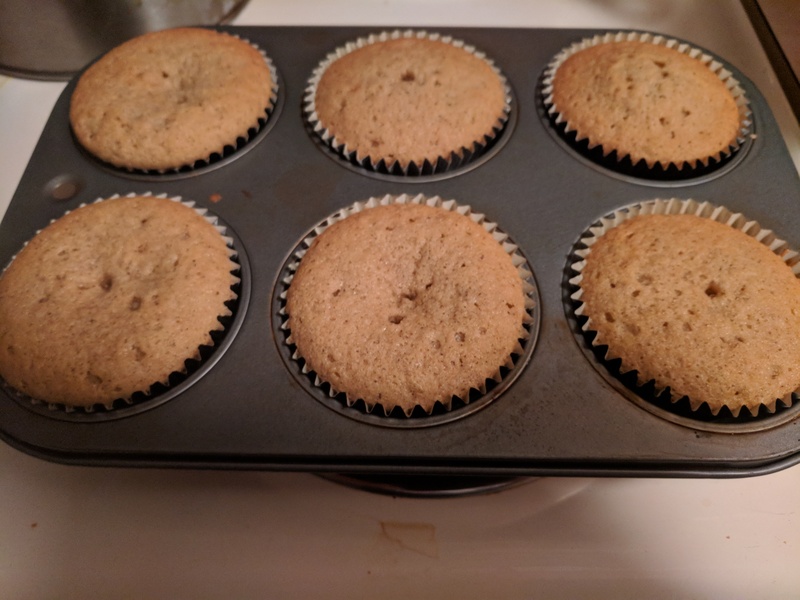 I’ve decided to dub these “ScapeCakes,” because it flows off the tongue easier than “CupScapes.” It might still need some workshopping, I tried to float the idea past my roommate but she was wholly uninterested in the ordeal and seemed more content with napping in front of the heat of the oven. In conclusion, I’m 35% certain that I was never actually playing any OldSchool RuneScape during this whole process, but I learned some important life lessons along the way like how there’s really never a bad time for cupcakes, I should probably take a class in cupcake decoration, and that this crew of Jagex staffers will get their mitts on my cupcakes when they pull them out of my cold, cupcakeless hands. I’m pretty sure this doesn’t qualify as a preview since I didn’t play anything, but I’m frankly too full of cupcake to remember what the original intention of this article was. Verdict/Disclosure: 4.5/5 – Jagex has discovered an innovative and delicious new way to deliver beta content, albeit this version isn’t as mobile as a game played straight from the phone. Thank you to Jagex for sending the cupcakes, this is not a sponsored post but more of an example on why I’m not allowed nice things. I don’t actually have access to the Old School Mobile Beta.